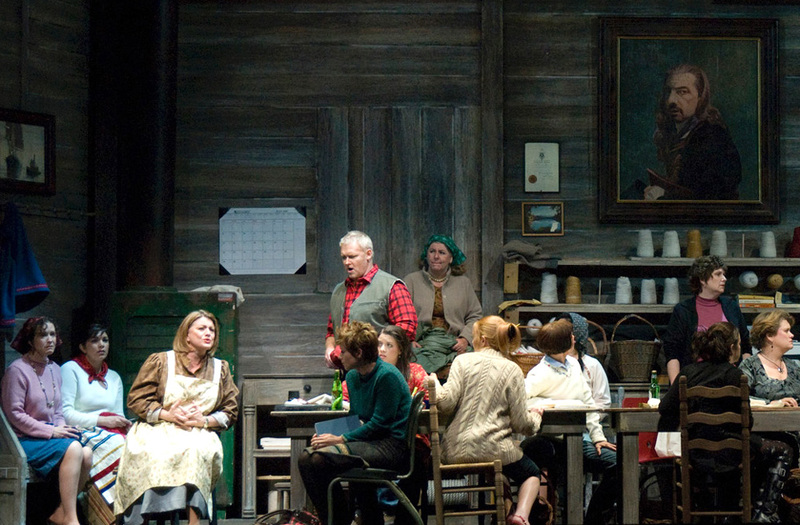 As this summer’s festival performances of Wagner’s Ring approach, we’ll be introducing Seattle Opera’s fantastic singers, Wagner’s memorable characters, and production elements such as the music, the costumes, and the sets on this blog and on our social networks. 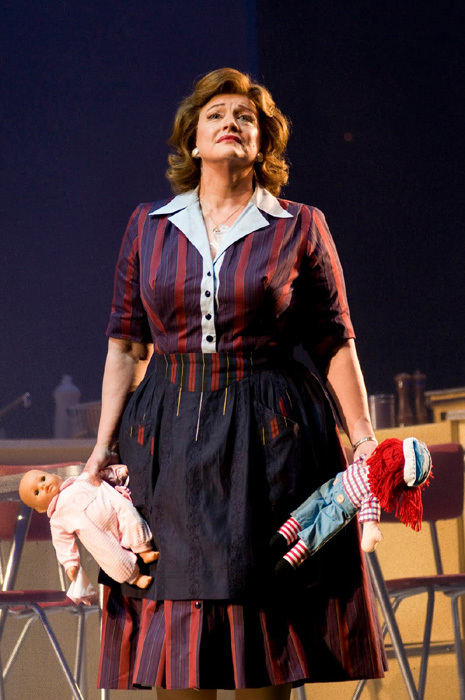 Let’s begin, today, by checking in with one of our singers, Luretta Bybee, who—like many in the cast—plays multiple roles in different Ring operas. Luretta made her Seattle Opera debut in 1990 as several characters in another epic opera, War and Peace. She has also been a memorable Carmen, Dame Quickly in Falstaff, and Klytämnestra in Elektra for the company; she made us laugh, as Wowkle in La fanciulla del West, and cry, as Paula in Florencia en el Amazonas and Amanda in Amelia. 2013 marks the fourth summer that Luretta, and her family, spend in Seattle working on our Ring. When she’s not in Seattle Luretta, who is Chair of Vocal Arts at New England Conservatory of Music, plays a major role in the development of the next generation of opera talent. You’ve been a Valkyrie in this production of the Ring for many years. Yes, the first time I was involved was in the 2001 Die Walküre, I sang Schwertleite. I sang that role again in 2005, and switched to Waltraute (in Die Walküre) last time, in 2009. This summer I’m back to Schwertleite again. What do you remember from that first experience, in 2001? What were the headlines? That may have been my first time working with Stephen [Wadsworth, the stage director], and I was a bit overwhelmed by the detail of the staging. And I remember the amazing camaraderie of the people involved. And another thing—my husband, Greer Grimsley, who is singing Wotan now. But he sang Donner and Gunther that summer. And it was a different experience living with a Donner-Gunther than a Wotan! For Greer, singing Gunther was a little bit like wearing the wrong size clothes. Mentally and emotionally, he was already heading towards Wotan...he was a good team player, that summer, but I think he was itching to tackle the bigger role. It took him two years to learn it, during which I coined the phrase "Wagner widow." When I remember Ring summers gone by, it seems like the nine of you are ALWAYS rehearsing that Valkyrie scene. Is there any scene, in any opera, more dense in terms of the staging—the thousands of tiny details that add up to make it so entertaining? The only thing I’ve ever done that compares was the Peter Brook Tragedy of Carmen. I did that in 1987, and I can still remember the staging—it was that detailed, that specific. Within a very tight framework, Brook convinced us that in fact we had a great deal of artistic leeway as performers. And though the challenge was much greater as an actor, he was absolutely right. The same is the case with this Valkyrie scene. Does Stephen Wadsworth’s staging of the Valkyrie scene change from year to year, as the cast changes? No, in fact, another singer had done my part, Schwertleite, in 2000, when Seattle Opera did a half-Ring with just Das Rheingold and Die Walküre. So in 2001, I was put into the part and followed her blocking. In the years since, I’ve helped other women who were new to the scene. 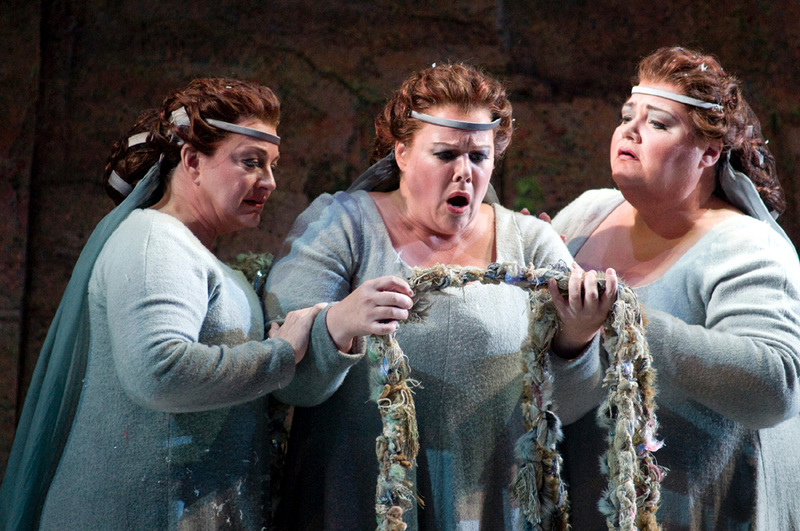 We share this swashbuckling, swaggering attitude; that’s the tone for the scene—at least until Brünnhilde enters. Sometimes it can be hard to tell all the Valkyries apart. Could you remind us: which one is Schwertleite? She has a great sense of humor, and is always trying to evoke a response with her sisters. You like getting a rise out of them...like in that moment when you kiss the severed head. Yes, I think they appreciate my sense of humor. The thing is, Schwertleite is grounded. If she’s laughing, everything is okay. How did you and Stephen develop this personality for your Valkyrie? And is Waltraute, the Valkyrie you sang in 2009, very different? Yes, she’s more serious, more of a stoic personality. She has a leadership role among the sisters—that much is written in the music and text. Now, many of these years you’ve performed both as a Valkyrie and a Norn. Yes, I sang the First Norn in 2001 and 2009, and I sing it again this summer. The Norn scene is incredibly detailed, too, but it’s easier than the Valkryie scene. Probably because the three of us—Stephanie [Blythe, the Second Norn] and Margaret Jane [Wray, the Third Norn] and I are incredibly close. We know each other so well, that makes it very easy. Can you compare the Norns’ scene to the Valkyries’? The Valkyries tend to be very outward-looking; they’re aware of everything external. The Norns are the opposite—all reflective, inward-looking, remembering. The Valkyries are looking to conquer and move forward, while the Norns want to go back to a better time. They sense that the end of something great and important is at hand. 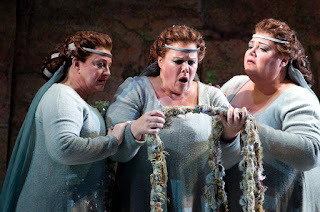 Luretta, put on your voice teacher hat for a moment and let me ask you: what does it take to be a great Wagner singer? To be perfectly honest, what it takes is, you have to be born with a great Wagner voice. You can’t train someone to sing Wagner. In my opinion we have a lot of ersatz Wagner singers, people who are trying to be Wagner singers. 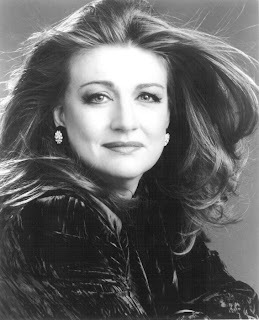 Particularly with this push in today’s world, to have opera singers who look like Hollywood stars. [Stage Director] Giancarlo Del Monaco once said, “If you have no horses in the stable, a donkey becomes your best horse.” What’s exciting to me about many of the Seattle Ring cast who are returning—Greer, Stephanie Blythe, Richard Paul Fink, Daniel Sumegi—is that they’re thoroughbred Wagner singers. The real deal. Do you sing much Wagner? Not a lot. I sang a small role in Flying Dutchman, and I’ve sung Fricka in Das Rheingold. I have a strong lower voice, which is necessary for Wagner, ‘cause you can get lost in the orchestra. One thing I find that separates Wagner singers from others is the ability to sustain a longer phrase. Wagner requires stamina. They’re so long—both his vocal lines and his operas! The story of the Ring is a family affair, and your own family has long been involved with this production. Could you tell us a little about how the three of you participate in the Seattle Ring? And then in 2009, Emma was 17, and Stephen invented a supernumerary character for her, the “Lady in Black” in Götterdämmerung. She appeared in Stephen’s Dutchman, too, in ’07: this punk kid with an attitude. Is there anything in particular you’re looking forward to about this summer? We’re looking forward to all being together and being home. Seattle is home, and the Ring is like a family reunion for us, being together with all these people we love. We’re feeling so grateful that we’re here, and healthy, and able to be together.